SHOCKING: THE WORLD’S LARGEST ASSOCIATION OF EARTH SCIENTISTS FUNDED BY CLIMATE-DENYING EXXON | "Global Possibilities"
The American Geophysical Union should be standing up for climate science and scientific integrity—not Exxon. SUVA, Fiji Islands — At their September meeting, the board of directors for the American Geophysical Union, the largest association of Earth scientists in the world, made a bad decision. They decided to ignore the organization’s own sponsorship policy and continue to accept money from Exxon, one of the world’s leading funders of climate change denial. The AGU’s decision puts those of us here in the imperiled Pacific Islands in a difficult position. As a professor of climate change, I teach my students to stand for scientific integrity—that the power of science emerges from careful evaluation of the data and drawing conclusions based on the data. I tell my students we need to lead by example, with integrity, to speak the truths that are revealed by the data, even when it is politically inconvenient. What do I tell my students now? What do I tell Pacific leaders about the backing they can expect from the scientific community? Science at its strongest is done with integrity, examining the data carefully. Leadership at its strongest is leadership by example. Threatened by climate change, the leaders of the small Pacific Island nations have shown what leadership looks like by negotiating the science-backed, historic Paris Agreement. As a life member of the AGU, I had personally asked the AGU board to show leadership and drop Exxon. I was joined by hundreds of my fellow Earth scientists and tens of thousands of climate advocates. As the AGU board convened its September meeting, ClimateTruth.org and the Natural History Museum hand-delivered over 53,000 petition signatures straight to their door. Yet, all of our pleas were ignored. AGU, as the largest association of Earth scientists in the world, could have shown the Pacific Island nations what scientific leadership looks like, by rejecting Exxon sponsorship and the scientific disinformation campaigns the company has waged for decades. Instead, the AGU board disregarded scientific integrity—and the union’s own internal sponsorship policy—to continue accepting Exxon’s money. We in the Pacific Islands don’t have time to wait until the investigations into Exxon work themselves through the courts to provide “the unequivocal evidence” requested by president Margaret Leinen and the AGU board. We don’t have the luxury of waiting, since our continued existence depends on world leaders taking action now to reduce greenhouse gas emissions. We ask AGU to stand with the Pacific Island nations and to defend scientific integrity the same way our Pacific Island leaders stood for science-backed policy positions in Paris. There, at the U.N. climate negotiations, the Pacific leaders led by example. Based on ever-stronger climate science, Pacific leaders pushed for science-based positions: higher ambition for reducing greenhouse gas emissions, a five-year review to ensure that the commitments to emissions reductions were being met, and a legally binding agreement. Before “Intended Nationally Determined Contributions” became part of the language of U.N. climate talks in 2014, the Pacific leaders had already made commitments to dramatically reduce greenhouse gas emissions in the Majuro Declaration on Climate Leadership. I presented the robust science of the Intergovernmental Panel on Climate Change at the Experts Forum in support of the 2013 Majuro Declaration on Climate Leadership. I was immediately and intensely questioned by the Pacific Island leaders about the billions of dollars in subsidies paid to fossil fuel companies. I was questioned about the role of climate engineering and what that meant for the Pacific. I was presenting the science from the perspective of a scientist unthinking of the context, history and the many reasons Pacific Island leaders have to distrust science and its assurances (think whale oil, Captain Cook’s voyages and 64 nuclear tests in Bikini Atoll). The Pacific leaders could see what I could not. Science is not enough. Science has to be able to stand with integrity and not be polluted with monetary subsidies, disinformation and distortions. Like Pacific leaders planning for the future, Exxon knew long ago that oil operations needed to plan for the impact of sea level rise. But even as Exxon privately prepared for a warmer world, it publicly attacked the science of climate change in an effort to protect its bottom line. In my role as the director of the Pacific Center for the Environment and Sustainable Development at the University of the South Pacific, it has taken me years of working with Pacific governments, training our climate change students and doing Pacific-based research to earn the trust and respect of the Pacific leaders—to convince them that I would stand up for the integrity of science. We have worked hard with our team of staff and students at the University of the South Pacific to ensure that we all stand for the integrity of the science. At PaCE-SD, we don’t shy away from taking difficult positions, and we support students to ask hard questions, to give a voice to the Pacific that is grounded in the integrity of the science. Our students are learning to tell the stories of why climate change is real in the Pacific by combining the human experience with the research and the numbers so clearly articulated by the latest research of scientists around the globe. Pacific leaders worked with the Pacific Islands Development Forum and its many partners, and PaCE-SD students and staff, to write the science-based Suva Declaration on Climate Leadership, which served as our blueprint for the Paris negotiations. The Suva Declaration was the strongest of the 10 climate change declarations made by the Pacific leaders. The journey to a successfully negotiated Paris Agreement was built on a foundation of science and its integrity. Will the Paris Agreement work? We don’t know, but we do know that without the integrity of the science guiding the implementation of the Paris Agreement, it will not. I asked AGU, as one of the strongest voices for science with its 60,000-strong membership, to stand with the Pacific Islands nations by deciding to not accept Exxon money. They failed us. For me, it was a personal request based on my commitment to serve the fifteen Pacific Island countries, and 120 communities, where we now work to build climate resilience: Kiribati, Republic of the Marshall Islands and Tuvalu, all coral atoll nations where floods and inundations are an everyday occurrence; Vanuatu, devastated by Tropical Cyclone Pam in 2015; Fiji, devastated by Tropical Cyclone Winston in 2016; Tonga devastated by Tropical Cyclone Ian in 2014; Federated States of Micronesia, Republic of the Marshall Islands, and Palau, where droughts led to states of emergency in 2016; Cook Islands, Nauru, Niue, Palau, Papua New Guinea, Samoa, Solomon Islands, and Timor L’este, our large ocean states struggling to cope with climate change. This is why the AGU decision to continue taking Exxon’s money is so profoundly disappointing. With so much at stake, AGU should be standing up for climate science and scientific integrity—not Exxon. 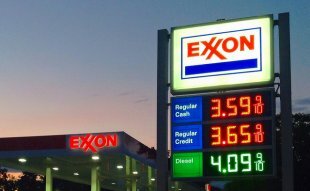 Stand with scientists and tell the AGU to drop Exxon sponsorship. Elisabeth Holland is Director of Pacific Centre for Environment and Sustainable Development, and Professor of Climate Change, University of the South Pacific.